Hello everyone! Gaji dah masuk belum? I have this habit of spending my money once my pay is banked in to my account because I live with the motto "Buy first, think later". I know it's not really a healthy motto to live with, but I always find ways to compensate back what I've spent on. At the end of this post, I'll share with you how you can get some value back from spending your money. I think I shall start with fashion haul and then later 'll share my beauty haul. The best purchase I had was the Rolling Stones sweater from Forever Twenty One. I've been wanting a Rolling Stones t-shirt for a long time but I haven't find any nice one yet. And this sweater is just perfect! Since the weather is getting cold lately, the sweater come just in time. Next, is the Coach e-mook. I don't really buy e-mook, in fact this is my very first one. It comes with three-piece stationery set. I bought it because I wanted the pouch to put my iPad. I really hate those flipping iPad case because it annoys me. I was looking for the pouch type, the Prada one was too expensive for me to afford. In fact anything branded is too expensive. So happen this pouch fits my iPad perfectly. It also comes with a really useful travel wallet which you can put your passport, cards, etc. There's also a zipper compartment behind for coins. I will probably use this as my work pad to put small notebook, namecards, leaflet, etc. The last piece is an empty notebook. I love the blank pages. Will use this as scribble pad for my blog stuff. The Coach e-mook is quite worth it for RM67.40. If you want it, you can get it from Kinokuniya, Japanese section. The next purchase is also something which I heart very much. It is the belt buckle bangle from H&M. Nice kan? It's only RM20+. If you want it, better get it faster. When I grab this one, only a few more left there. It comes in few sizes so you can choose according to your arm size. And the last piece from my fashion haul is my new flip flop that I bought from Pay Less Shoes. I saw the teal color flip flop and immediately fell in love with it. There's something about teal color that attracts me. Maybe I've been Tiffanied by the color. LOL! Totally not part of this haul, but it is something which a lot of you been asking me. I wore my white dress with black lace to KL Fashion Week which received so many comments and people wanting to know where I got it.I bought it sometime ago in Pavilion from Fashion Supermarket, I think? I was so sorry that I couldn't give the exact answer, but guess what.... 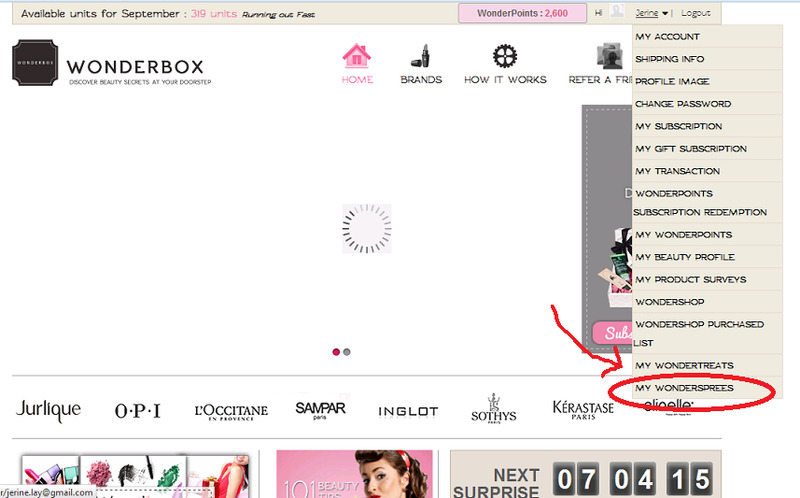 I found it in Zalora!!!! Now you all can go buy it from <<here>>. It's not from the same brand, but it looks exactly the same. And moving on to beauty haul. I've showed you all in my Product Empties August 2013 post that my MAC Pro Longwear SPF10 Foundation already finished, so it's time for me to stock up. It is very convenient for me to get the same color that suits my skintone from MAC. I didn't buy it because it is the best foundation, but rather out of convenience sake. You know it is hard to find the perfect foundation? I've spent so much money on the wrong foundation and I don't want to risk that again. To play safe, I keep sticking on to this MAC foundation that I find not too bad, other than it's a bit dry. Will have a separate post for it soon. I don't want to rant about it too long over here, which I already did. If you have purchase from MAC before, do keep in mind of their Back to MAC program. Just bring 6 empty packaging of MAC back to their store, and in exchange they will give you a full size lipstick with the shade of your choice. I love it how the tied the paper bag with suede instead of their signature ribbon. And it is tied with a large peony card so the whole world knows you have Peony & Blush Suede inside the paper bag. If you happen to be at Pavilion, do drop by Jo Malone's boutique and take a sniff at the Peony & Blush Suede. You'll fall in love, this I guarantee! I took advantage of the Maybelline Merdeka Sale at Guardian and purchase 3 items - the Rocket Volum' Express mascara, Hyper Glossy Liquid Liner, and Colorsensational Lipstick. It was so dirt cheap, too bad each customer can only purchase 3 items. Guardian is having some promotions for Oslee products. If you want to try out Oslee stuff, do drop by Guardian to check out the deals. I got the Rosehip Hydra-white Cleansing Powder and Facial Toner for RM79. If you buy individually it would be about RM90+? I'm not sure the full retail price, but my point is... it is really cheap if you buy the set from Guardian. And I also got the Pomegranate Milky Mask. Can't wait to try it. 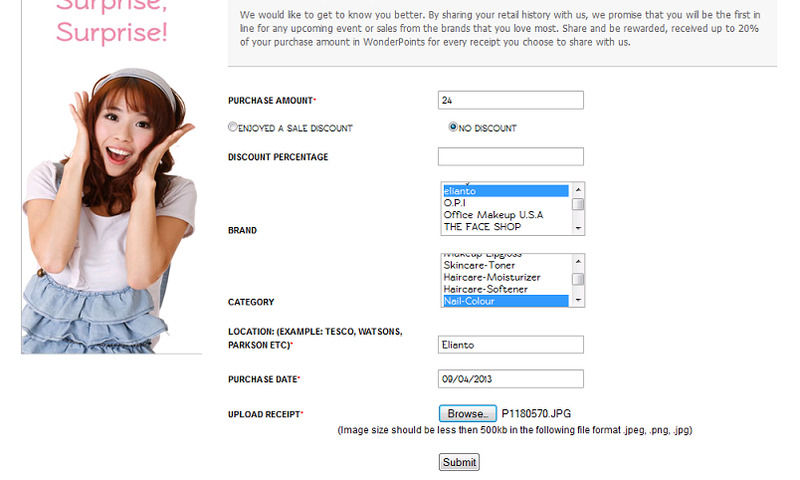 Just key in all the necessary info, upload your receipt and the click submit. You will be rewarded with points. 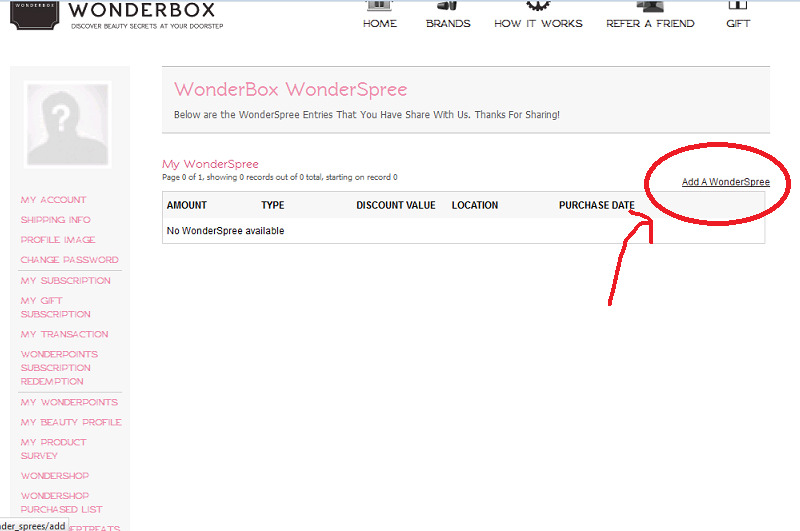 With the points you can redeem beauty box from WonderBox or redeem products from their WonderShop. I've uploaded my Elianto purchase receipt and received 100 points. The next time you shop for beauty products, remember to keep your receipt. You might score some WonderPoints with it. LauraLeia: If I don't need the pouch for iPad, I wouldn't get it too. @choulyin: I'm not sure if they are going to have malaysia day promotion. Do check out the maybelline FB page. That's how I found out their sale.